The term ‘colour’ actually refers to the absence of colour. A diamond is considered more desirable and valuable with a lesser amount of colour. A master set of stones owned by gemmologists is used to grade the amount of colour in a diamond and subsequently where on a scale of D (colourless) to Z (greyish cream) the colour of a particular stone falls. Anything beyond Z is considered a ‘Fancy’ colour. Clarity refers literally to how clear the diamond is when viewed closely by taking into account the inclusions (imperfections) contained within the body of the stone. These are either little bits of carbon that contaminated the diamond crystal as it formed, or small tears and fissures in the crystal lattice. They show up as anything from large dark or white blobs to tiny specks that can only be seen under high magnification. Some of these differences are not visible to the naked eye but directly impact the overall quality and price of the stone. Diamonds are usually graded by the position, quantity and colour of these inclusions. If the inclusions fall within the table facet (the large flat surface on the top of the stone) then they mar the appearance of the diamond much more than if they are lost in the facets around the edge, or ‘girdle’ of the stone. Inclusions that occur around the edge of the stone are often less visible as there is so much dancing light in the facets that they are hidden. You should think of clarity in two ways: There are basically good ‘clean’ stones that have small inclusions in them, and then there are stones that have a haze of tiny inclusions that cannot be seen with the naked eye but which reduce the performance of the stone in the same way that light is reduced as it passes through a dirty window. This means that sometimes a stone will be graded as vvs (very, very, small inclusions) but will look lifeless next to a stone with much larger inclusions and a poorer grading. This, of course, makes it a bit tricky and shows where a simple grading system can let you down. It’s best, where possible, to see and compare stones with the help of your jeweller to make an informed choice. I1 and I2 and I3 – Inclusions. This is the one characteristic of a diamond where man has more influence than nature. The way the stone is cut is critical to how the stone sparkles. Diamond is an amazing material as, not only is it the hardest material known to man, but it also has a very high refractive index. This means that light coming into the stone is bent to a degree that makes it possible to bounce it around within the stone and send it back out of the crown rather than light disappearing straight through as it would with a piece of glass. The term used to describe the amount of light that makes it back to the eye is ‘Brilliance’. If the cut is too shallow or too deep then light may be lost through the bottom or ‘pavilion’ of the stone and it’s brilliance diminished. Stone weights are measured in carats with 100 points equalling one carat. 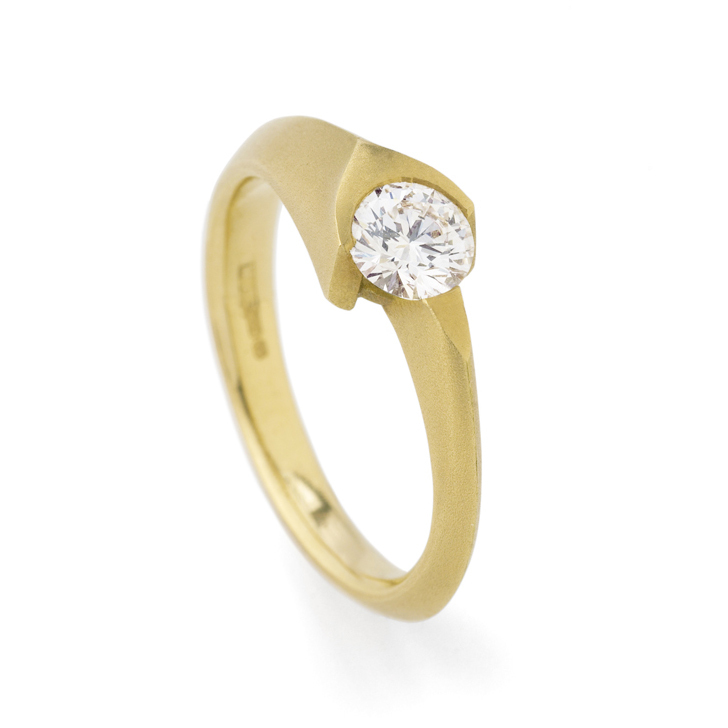 A stone could be described as 0.50ct, 50 points, 50pts or 1/2 carat; they all mean the same thing. Generally speaking, the higher the carat weight of a single stone, the more expensive it will be. However, two diamonds of an equal carat weight may have very different prices when their cuts, colours and clarities are considered. Diamond certificates are produced by a number of different gemmological laboratories where gemmologists judge the various characteristics of a diamond and record them on a certificate. The accuracy relies on the skill of the gemmologist rather than being an absolute measurement made by a machine. They are very useful as a guide to selecting a suitable diamond although the final choice is best made by comparing several stones in the company of your trusted jeweller who can point out the differences and help you to select your ideal diamond. Besides the usual ’round’ or ‘brilliant cut’ diamonds can be cut into various shapes. These include ‘princess’ cut which has it’s facets arranged to maximise brilliance from a square shapes, ’emerald’ and ‘baguette’ cuts which are less sparkly, with a quieter, ‘ice’ brilliance and ‘marquise’, ‘pear’, ‘heart’, ‘oval’ and ‘trillion’ shapes. Before proceeding with a commission, I may borrow a few suitable stones from my diamond dealer so that I can discuss their various merits with my clients. If necessary, I can then return them and repeat the process until we find the right stone. The single most important thing about buying a Diamond is that you trust who you buy from. For more information regarding the commissioning process – see the commissions page.